Please see here for guidance for contributors. 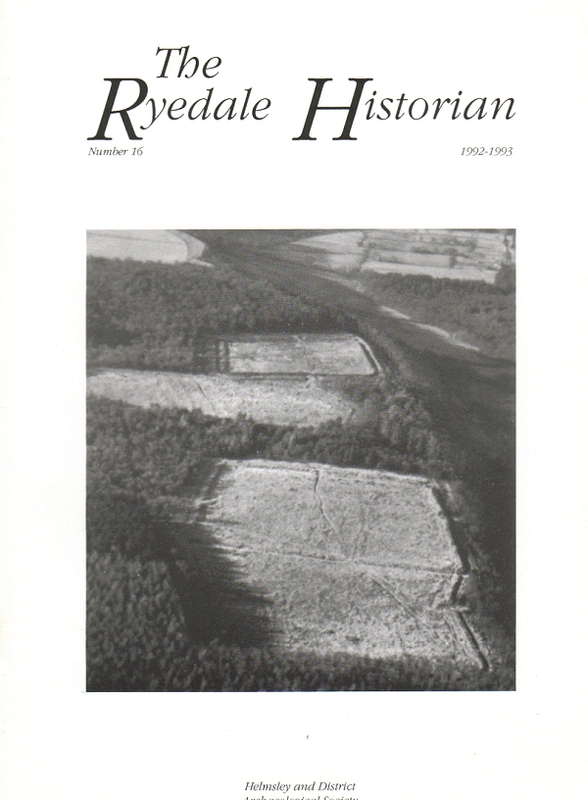 The first issue of the Society's biennial publication, 'The Ryedale Historian', appeared in 1965. 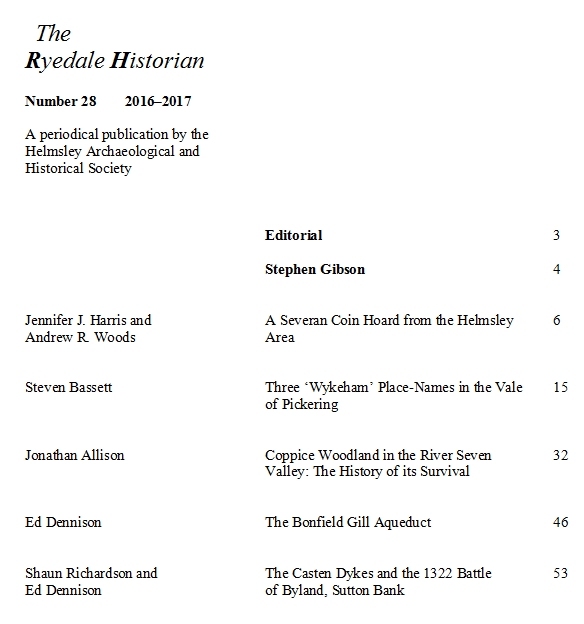 Compiling 'The History of Helmsley, Rievaulx and District' had created an appetite within the membership for further historical and archaeological research and the Society's periodical, 'The Ryedale Historian', enabled the results to be published. 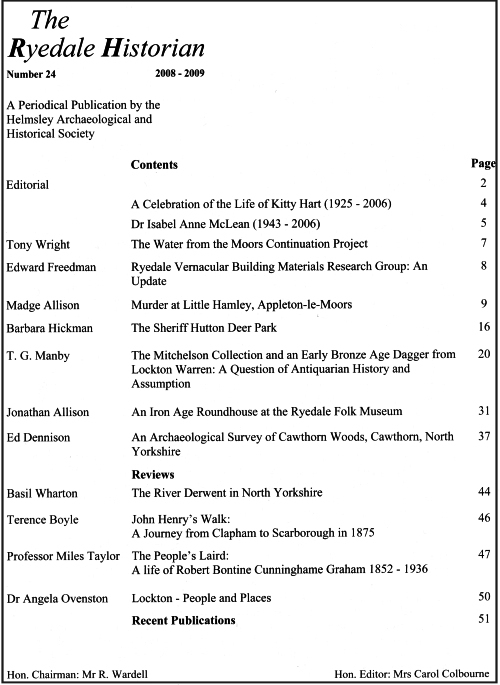 The Cumulative Index shows the wide range of topics that have since been covered, and it is not surprising that the issues of 'The Ryedale Historian' have become a valuable resource for anyone seeking information on the history of the Ryedale area. 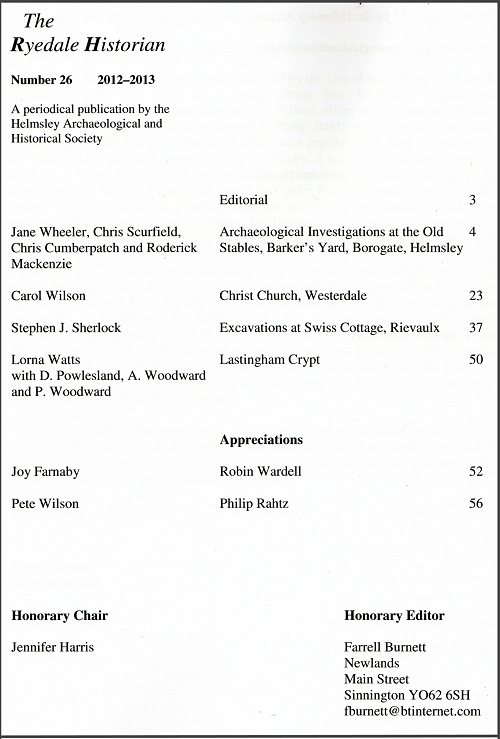 Members of Helmsley Archaeological and Historical Society can purchase the current Ryedale Historian at a reduced rate of £4 from Committee Members at the various Society events. Alternatively, send a request via the Contact Us page. We will then email you with the cost (including postage), and either details of our account or an address for you to send a cheque. 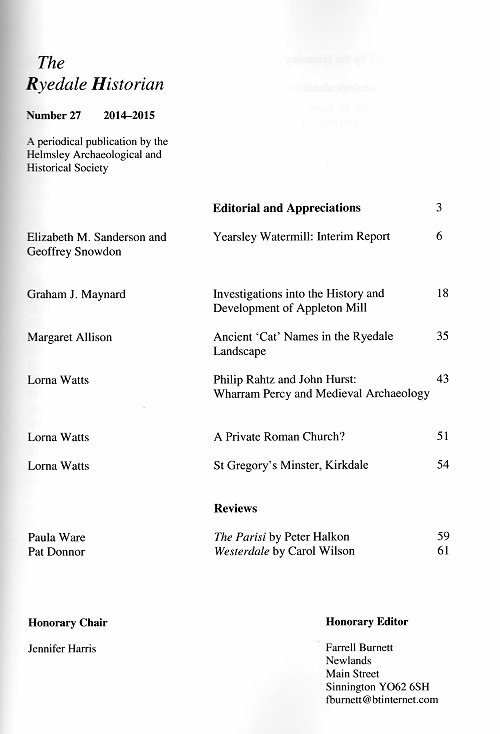 The Ryedale Historian has been publishing articles on the history and archaeology of the Ryedale area in North Yorkshire since 1965; issues, which appear every two years, may also contain book reviews, summaries of archaeological and historical work in progress, and news about the Society and its members. If you are considering submitting an article to The Ryedale Historian, please read these notes before preparing the final draft. 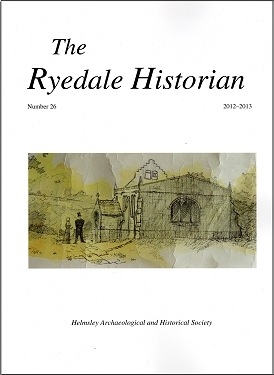 The following back-numbers of The Ryedale Historian are available for purchase at £2 each via the Contact Us page. We will then email you with the total cost (including postage), and either details of our account or an address for you to send a cheque. The contents of all available Back Numbers can be seen from the Cumulative Index. 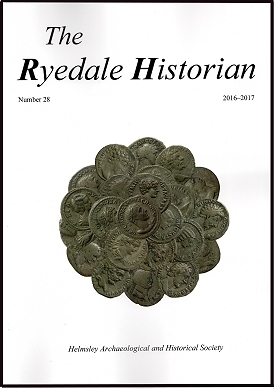 We are unfortunately unable to supply, provide or sell copies of individual articles within other back numbers of the Ryedale Historian - principally due to the copyright residing with the original Author(s). You may be able to acquire a reprint of a specific article by contacting the Author(s) directly (Try Googling their name, together with key words from the title). Alternatively, many of the local North Yorkshire Libraries hold copies of the Ryedale Historian which may be available either for loan, or for reference only. The contents of all the Ryedale Historians can be seen from their Cumulative Index.